Get paid much faster, make more money, save on billing costs. Work comp tools that increase your revenue and decrease your costs. Smart technology designed to make workers’ comp simple. Reduce billing data entry by integrating with DaisyBill. Instantly calculate workers' comp fee schedule reimbursements. Workers' Comp Is Incredibly Complicated. We Make It Simple. Instant workers’ comp fee schedules, IBR decisions, MPN List, Claims Administrator Directory, Fee Schedule Alerts, Live Chat Help from our workers’ comp experts, and much more. Convenient search tool for Independent Bill Review decisions. 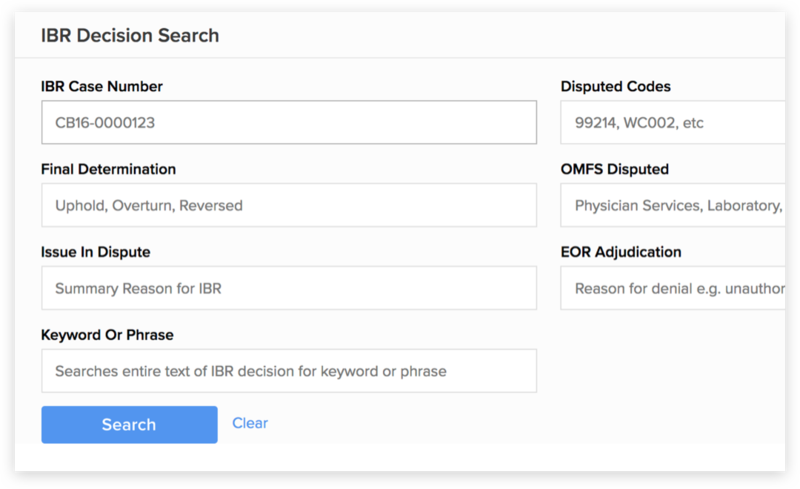 Find, review, and reference every IBR decision relevant to your practice. Use our searchable IBR tool to find decisions that help you interpret complex payment rules and requirements. Easily search all IBR decisions by keyword, specific procedure code, and date of service. Download relevant IBR decisions in PDF format, then incorporate them in your Second Review disputes over reimbursements. Get up-to-date IBR decisions immediately. When the DWC posts new IBR decisions, DaisyBill automatically adds the new decisions to the IBR database. Get news you can use: fee alerts, billing tips, and webinar announcements for workers’ comp.